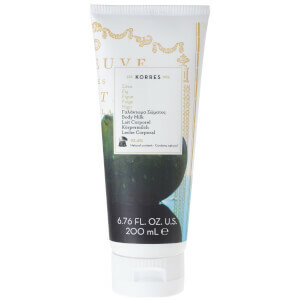 Drench skin in hydration with the KORRES Yoghurt Shower Gel; a creamy body wash that cleanses the body, whilst offering a long-lasting moisturising effect. Effortlessly lathering over skin, the fragrant soap gently and effectively cleanses away daily dirt, oil and impurities. Boasting a Greek Yoghurt based formula, the refreshing shower gel is enriched with multiple Wheat Proteins, which form a protective film over skin to help the body to maintain healthy hydration levels. Alongside offering a veil of rich moisture, the foaming shower gel is enriched with Active Aloe® to combat loss of elasticity and stimulate collagen synthesis. This helps to reduce visible signs of ageing. Expect the body to feel refreshed, rejuvenated and comfortably hydrated. 86.4% Natural content. Suitable for vegans. Free from Mineral oil, petrolatum/paraffin wax, silicones, parabens, propylene glycol, ethanolamines, SLES, ALES, synthetic dye, phthalates, polycyclic musks, retinol and animal by-products. Shake well before use. Add water to create a rich lather on the skin. Rinse with water. 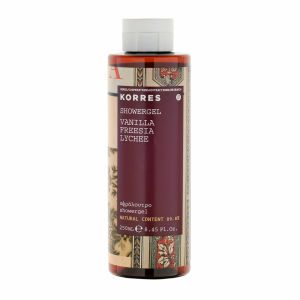 After bathing, use KORRES Body Butter to lock-in moisture. Aqua/Water/Eau, Sodium Laureth Sulfate, Cocamidopropyl Betaine, Sodium Cocoyl Isethionate, Coco-Glucoside, Glyceryl Oleate, Parfum/Fragrance, Acrylates Copolymer, Aloe Barbadensis Leaf Juice, Alpha-Isomethyl Ionone, Althaea Officinalis Root Extract, Amyl Cinnamal, Arginine, Beheneth-10, Benzyl Alcohol, Benzyl Salicylate, Castoryl Maleate, Cetyl Palmitate, Coumarin, Geraniol, Glyceryl Stearate, Guar Hydroxypropyltrimonium Chloride, Hydrogenated Castor Oil, Hydrolyzed Wheat Gluten, Hydroxycitronellal, Imidazolidinyl Urea, Isoeugenol, Lactic Acid, Linalool, Phenoxyethanol, Polyquaternium-7, Potassium Sorbate, Sodium Benzoate, Sodium Chloride, Sodium Dehydroacetate, Sodium. 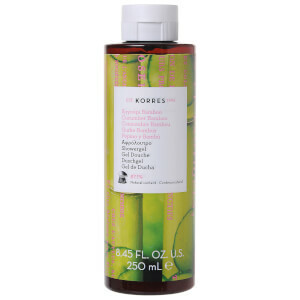 This is my new favourite korres shower gel. It smells divine and leaves my skin feeling lovely and soft. The formulation seems to be a bit more nourishing than the others shower gels which is a bonus.